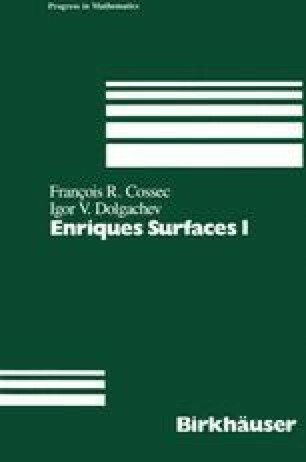 Enriques surfaces bear the name of one of the founders of the theory of algebraic surfaces, the Italian geometer Federigo Enriques. He constructed some of them to give the first examples of nonrational algebraic surfaces on which there are no regular differential forms. At the same time a different construction of such surfaces was given by another Italian geometer, no less famous, Guido Castelnuovo. The original construction of Enriques gives a birational model of an Enriques surfaces represented by a surface of degree 6 in P3 passing doubly through the edges of the coordinate tetrahedron (see [En 1,En 4,AS,G-H 1]). Castelnuovo’s model is a surface of degree 7 in P3 with a triple line and other singularities (see [Cas,En 4]. Later on Enriques [En 2,En 4] gave a construction of his surfaces as double planes with some branch curve of degree 8. We discuss these models in great detail in Chapter 4. Subsequently G. Fano [Fa] constructed a family of Enriques surfaces represented by congruences of lines in P3 associated to webs of quadrics (see [Cos 2,[G-H 1]). We will discuss this construction in Part II of this book. In [En 3] Enriques observed that every Enriques surface can be obtained as a quotient of a surface of type K3 (in modern terminology) by a fixed-point-free involution. The first modern treatment of Enriques surfaces over fields of characteristic different from 2 was given by M. Artin [Art 1] and B. Averbukh (see [AS] Chapter IX, [Av]).